Experience the fun for yourself! Let’s get this party started now! Who says dirty dancing can’t be good clean fun? Prime Time has created the ultimate foam dance pit. Great for all kinds of special events, foam dance parties, college events, beach parties, raves bars, night clubs and promotions. Rent the machine only and fill a dorm room, fraternity house, or any area you like! 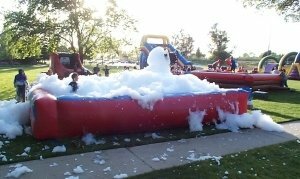 The foam machine fills the pit with a very robust & safe, non-toxic foam.... (that won't hurt your eyes or clothing!)..... in about 6 minutes. GREAT FUN!!! A very unique experience! 25' x 25' area required for inflatable.